Project obstacles and solutions: In 2015, Toyota Motor Engineering and Manufacturing North America announced it was building a new stand alone research facility that would house their Production Engineering Team. The two story, 251,000 square foot facility was designed to include a lab, a dining area, plus conference areas and office space for 700 employees. Walbridge served as the general contractor for this project. Baker Concrete poured and finished all of the slabs. Able Construction poured the foundations and pier caps, while McKinney Drilling performed all of the caisson construction. Frontier Enterprises poured all of the light bases in the parking lot. 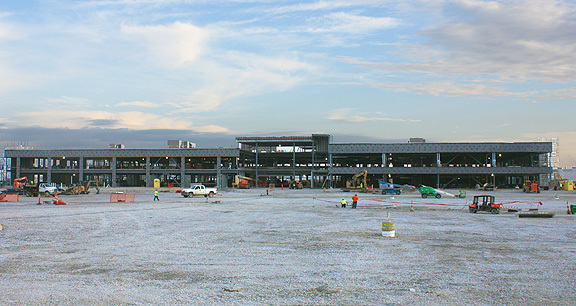 Fox Enterprises paved all of the curb and gutter work on the site, which included a 760 car parking lot, roads and entryways. Toyota announced that it was their expectation to achieve LEED Platinum status with the new facility. LEED Platinum is the highest level of energy-efficient design recognized by the U.S. Green Building Council's (USGBC) LEED rating system. A LEED Platinum certification can be awarded to a new construction project which achieves at least 80 of 110 points in seven categories (Sustainable Sites, Water Efficiency, Energy and Atmosphere, Materials and Resources, Indoor Environmental Quality, Innovation in Design, and Regional Priority.) To those ends, the mix designs for the concrete on this project were scrutinized on three aspects pertaining to this criteria: pozzolan post-industrial waste products in the the mix (particularly slag and fly ash), water-to-cement ratios and coarse aggregates. In the case of fly ash and slag, both can be substituted for a portion of the Portland cement in a concrete mix. However, both can impact set times and strength gain, especially in colder weather. This created a delicate balance of meeting LEED Manufacturing and Resources credits for post-industrial waste content and making sure the concrete set on time. IMI QC/QA worked with the site engineers to design mixes that met the demands of LEED acceptable levels of fly ash and slag without compromising set times and slowing the production schedule. Water-to-cement ratios were also watched carefully to ensure the concrete met strength requirements. IMI QC/QA used blended aggregates in the mixes for added strength. Another area where architectural design crossed sustainability requirements was in the coloring of concrete. A portion of the floors were to be finished with a shake on color hardener for its aesthetic appeal. Typically, hardeners must have a straight cement mix and enough bleed water to activate them. Again, IMI QC/QA worked with the engineers, manufacturers and finishers to design a mix that would allow the shake on hardener to be used without compromising the LEED Platinum status. IMI supplied 12,000 yards of concrete for the Toyota Engineering research facility. Most of the mixes used underwent extensive testing in the IMI labs in Louisville, Kentucky to meet engineering specifications. For more information on designing concrete to meet tight specifications, click here. To see how our building materials meets LEED credit requirements, click here.